As president of the Volunteer Council this year, I serve as an ex-officio, voting member of the League of American Orchestras’ Board of Directors. 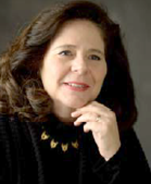 I look forward to joining the 44 other members and honorary members on the Board who come from all areas of the orchestra field, who are affiliated with orchestras of all sizes, and who share a commitment to American orchestras and the music they play. I would also like to take a moment here to thank all of the volunteers who donated to the League this past year. Your support helps fund the League’s programs and activities, including programs directly supporting volunteers such as the volunteer sessions at the National Conference in Seattle, our quarterly Volunteer Notes, and our new online webinar on fundraising fundamentals. Your contribution also helps the League continue its wide-ranging efforts to ensure the future of our orchestras by helping them strengthen and improve governance, align with community, achieve fiscal health, and nurture creativity. The League helps our orchestras and our volunteer associations navigate these shifting currents, and your support helps the League do this work. Do you ever wish someone would magically appear to you or your organization when you need help, advice, a new idea, or to add to your own experience and expertise? Well, the Volunteer Council of the League of American Orchestras has made this magic happen in the form of computer delivered webinars that you can access whenever you want -- and they are available at no charge! These webinars, written and produced by volunteers for volunteers, can be viewed by an individual, a small group, or a room full of people. Webinars are narrated lectures with illustrative graphics created and delivered by League Volunteer Council members with expertise in the subject areas. At the end of each webinar, there are suggested follow up activities and resources for continued learning. The text of the webinar as well as the on-screen slides can be downloaded for review after the webinar. Present topics include: The 3 R’s of Leadership: Roles, Responsibilities, and Resources; Strategic Planning for Symphony Orchestras Volunteers; Recruiting Your Next Generation of Volunteers; and the latest, Fundraising Fundamentals: An Introduction to Grassroots Fundraising. Go to the League’s website americanorchestras.org. Click on “Volunteerism.” From the list of Online Resources that appears, choose the webinar you wish to see. 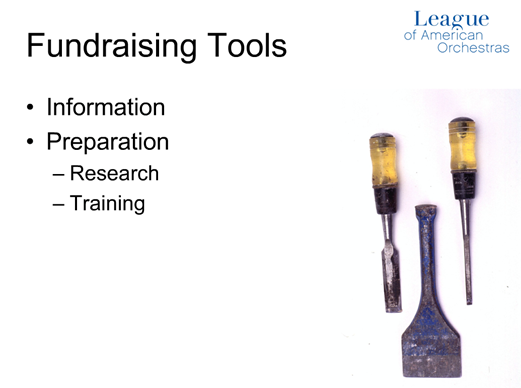 Here is a sample screen and narrative text from the Fundraising Fundamentals: An Introduction to Grassroots Fundraising webinar. Practice making an “ask” with a partner. Start small by asking for a donation to a silent auction. Then advance to something larger. Remember to be clear for what you are asking. Be able to present three solid values or benefits of their donation. Brainstorm other non-profit groups in your community with whom you might partner for a successful fundraiser for both groups. Look through the Gold Book and pick out a new fundraiser that looks interesting to you. In addition to these and other activities, the webinar includes practical worksheets, sample report forms, and additional resources for further learning. Consider projecting the webinar on a large screen to view with others. Host a "lunch and learn" session for your group, or for your group and other arts organizations in your area. Extend the learning. Set aside time at the end of the webinar to explore new ideas and possibilities with your group. At the end of each webinar there are suggested activities to get you started. There are also suggested readings for further learning. Greetings from the League’s D.C. office! With midterm election season upon us, now is a good time to get caught up on what’s coming ahead on the policy front and how you can help. If you aren’t already familiar with the League’s website, you will find a wealth of information in the Advocacy & Government section, such as background on an array of issues like tax policy and NEA funding; resources to understand what it takes to travel with instruments containing endangered species material or how to obtain a visa for a foreign guest artist; and tips on how to be an effective advocate. There are also links for contacting your members of Congress about orchestra-specific issues that matter to you the most. For example, you can help us urge the Congress to approve permanent enactment of the IRA Charitable Rollover – we’ll be continuing to press this message for the rest of the year and elected officials need to hear from their constituents. We are constantly updating the site to provide the latest policy developments, to let you know key moments to contact Congress, and to share what the League has been doing on your behalf. With many new members of Congress expected to take office in 2015, we are anticipating a very busy year. Advocates across all sectors will be hard at work developing new relationships, educating new Representatives and Senators, and telling their own compelling stories. Please help us by keeping the League’s D.C. team up to date on your key connections to elected officials, what you know about their interests, and how you’re progressing in your relationship-building at home. Together we can make a difference: let’s make sure Congress hears from every orchestra about how vital we are to our communities! Governance Board Game Goes Viral! From Seattle and Spokane, WA to Columbia, SC, symphony volunteers are rolling the dice and racking up points, all while learning about governance … most importantly, some are also winning chocolate prizes! 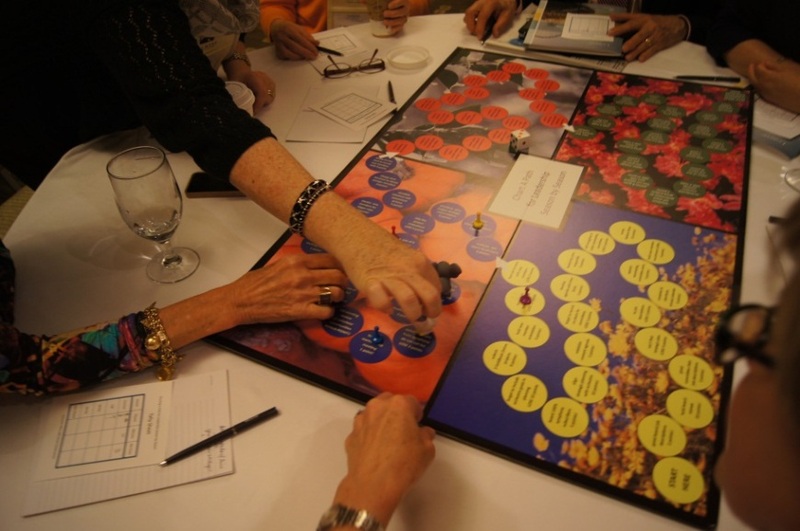 Developed by the Volunteer Council for the 2014 League of American Orchestras’ National Conference in Seattle, the board game, titled Charting a Path for Leadership Season by Season, was an unexpected hit with the delegates. As most of us know, the subject of governance will often cause one’s eyelids to become heavy - but is it really that dull? The concept behind this game is to make learning and discussion about good governance fun – and have we mentioned competitive? The idea is so simple - traverse a game board accumulating positive points for a job well done in a particular aspect of governance, or negative points for, well, bad governance. Lose a turn! No reason, just life! At Conference, delegates played in groups of eight – there were 12 tables in all. At each table, winners by point tally earned delicious Symphony chocolate bars. The overall high point winner received a fabulous box of chocolates from famed Seattle chocolatier – Fran’s. Our very smart delegates helped game developers (and Volunteer Council members) Elaine Cousins and Linda Weisbruch work out the “kinks” on this, the game’s maiden voyage. Following Conference, Elaine and Linda have continued to receive great feedback about how to make the game even better – and have had several requests to share the game. Interested in playing the Good Governance game in your neck of the woods? The board graphics, score sheets, and handouts will be available for download soon on the Volunteer section of the League website. Additionally, Elaine and Linda will be happy to advise on where one can locate board pieces and dice for a very small investment. Isn’t it time you charted a path to leadership and laughed all the way there? A pre-concert New Year's Eve party for 100 guests was held at The Great Hall, a beautiful, historic setting at a local college. This event was a real collaboration between the Orchestra and Chorale’s board, staff, and volunteers. Read more about this successful fundraiser when it is featured in the Project of the Month Series on the Hub (the League’s daily news site) in December. A holiday tradition for Bay Area children and families since 1980, Deck the Hall includes a concert, festivities, and the unveiling of fir trees decorated by local non-profit organizations in the lobby of Davies Symphony Hall. The second day of this two day event is called the Deck the Hall Community Day, as approximately 2,000 low-income children, served by San Francisco child development and social service organizations, and their chaperones, attend the event free of admission. Read more about this successful fundraiser and community engagement event when it is featured in the Project of the Month Series on the Hub (the League’s daily news site) this November. On a snowy day in early December, in the midst of the orchestra’s lock-out, Friends of the Minnesota Orchestra gathered for friendship, food, and festivities at a Holiday Social. Conversations were held over lunch, followed by an informal fashion show using member models. 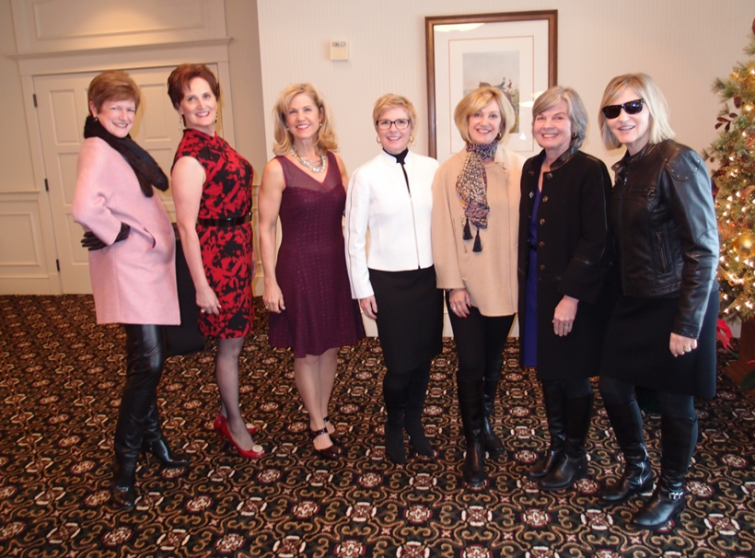 The Friends Board members enthusiastically welcomed guests and the Friends President gave an organizational update. During a time of unchartered territory for the Friends, this event was a thankful opportunity for sharing friendships, cemented through volunteerism in the name of music. One of the networking opportunities for volunteers during the League of American Orchestras’ National Conference is the Volunteer Council's Dine-Arounds. Volunteers registering for the Conference can sign up for a dinner at a local restaurant with the idea of "comparing notes" with several others from organizations across the country. Last June, in Seattle, the Volunteer Council shook things up a bit and held a contest during each of the two consecutive Dine-Around evenings. Select a local restaurant and pitch a partnership for raising funds. 10% of total bill is donated to the symphony (this applies to To-Go orders as well). Winners of Dine 2 Donate included: Sherry Amlung, Indianapolis Symphony Orchestra Association; Lynn Marquardt, Billings Symphony Orchestra & Chorale; Jane Schwartz, Augusta Symphony Guild; and Debbie Washburn, Huntsville Symphony Orchestra Guild. The assignment on Day 2 was to propose a Recruitment/New Member event. The winning idea incorporated food and fun. Hold a champagne brunch at a member's fabulous home. Have entertainment - an interesting demonstration or influential speaker. Present your events in an energetic manner that leaves prospective members wanting to learn more. Winners of the Recruitment event included: Ryan Darwish, Eugene Symphony Guild; Sandra Weingarten, Eugene Symphony Guild; Tricia and Steve Wiggs, Women's Symphony League of Tyler; and Elaine Cousins, Illinois Symphony Orchestra! "It's May, it's May, the Merry Month of May." Join us this coming May for beautiful springtime in Cleveland at the League of American Orchestras’ National Conference. The parks will be blossoming, the museums filled with art, and the neighborhoods welcoming visitors with open arms. There are progressive restaurants like the Happy Dog Tavern where members of The Cleveland Orchestra perform late night sets; The Rock and Roll Hall of Fame is just around the corner; and University Circle, a collection of great institutions, surrounds Severance Hall, winter home to The Cleveland Orchestra. In performances at home and around the globe, The Cleveland Orch­estra remains one of the most sought-after performing ensembles in the world, and Northeast Ohio’s most visible international ambassador. In concerts at its winter home at Severance Hall and at each summer’s Blossom Music Festival, in residencies from Miami to Vienna, and on tour around the world, The Cleveland Orchestra sets standards of artistic excellence, creative programming, and active community engagement. With the 2014-15 season, Franz Welser-Möst enters his thirteenth year leading the ensemble, with a commitment extending to the Orchestra’s centennial in 2018. This artistic partnership continues to move the ensemble forward through a series of new and ongoing initiatives. Plan now to attend the Conference’s volunteer track! Take advantage of the learning opportunities including best-practices and best-projects in fundraising, membership, music education, service, and community engagement, as are being done by volunteer organizations across the country. Come network at our restaurant Dine-Arounds. Don’t miss the acclaimed Cleveland Orchestra! Online registration and hotel reservations will be open in January 2015. The Conference will be held at the Cleveland Convention Center, with events happening throughout the city. Sharing innovative ideas, making friends from around the country, learning project structures - all for the love of music - comes once a year at Conference. See you in Cleveland in "the merry month of May!"